This build started out as a challenge from a friend to build something other than a “grey” Eagle. Purchased in 2008 at the NSW Scale Model Show, nothing really happened in terms of construction until the latter part of 2009 due to work commitments. 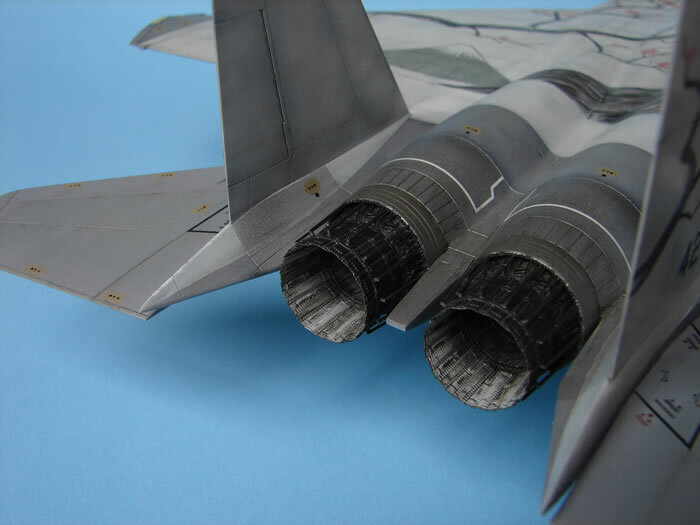 My immediate choices were either a F-15C in aggressor markings or a F-15I, however at the same show I came across the Wolfpack F-15J conversion kit, so I started down that path. 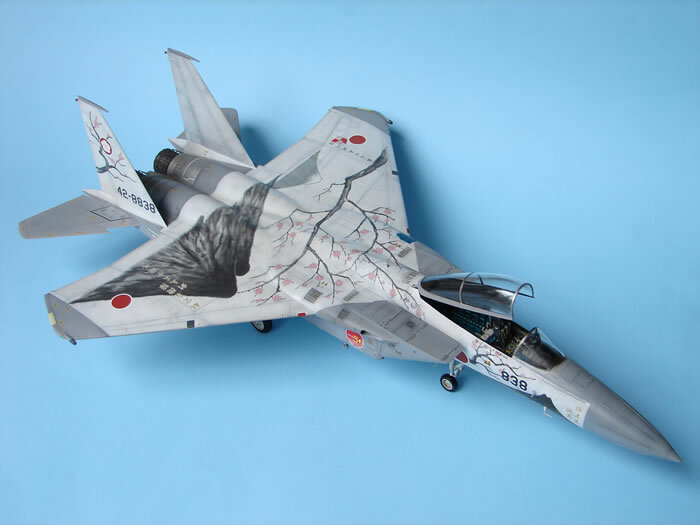 I knew of the “White Dragon” F-15J (and I have this in 1/32) but I also had a 1/72 Platz sheet that I had picked up for a Macross build that was quite unusual. It took several months scouring Japanese websites but I finally found the sheet I was looking for in 1/48. 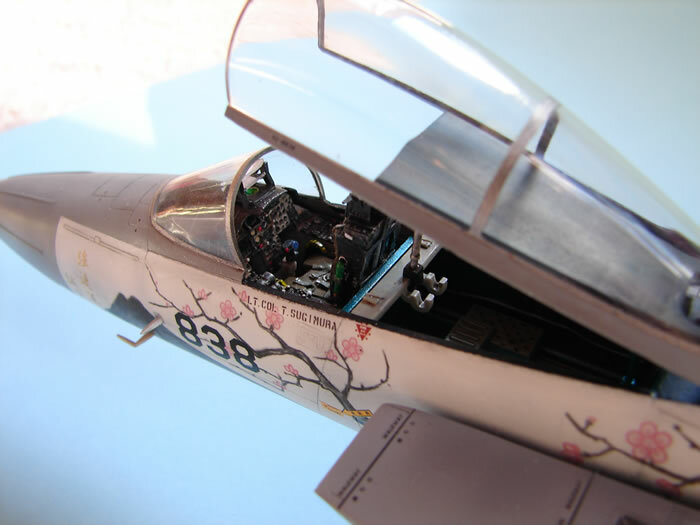 The kit was built up as an airframe displaying the JASDF 50th Anniversary scheme of the 305th TFS at Hyakuri Air Base (as of 1st July 2004). The markings come from a Platz sheet, number JD48-21. The Aires cans add quite a nice touch to the kit and they pretty much just slot into place, however the actuator arms for the petals would appear to be short as both myself and another modeller replaced these items with evergreen strip. It is possible that both of us did not remove as much material as required from the rear end to allow the actuators to fit. Although not required to create the conversion, a new seat was source from Legend Productions from Korea. Wing landing lights were cut out and replaced with clear sprue sanded to shape and the AOA probes were replaced with stretched sprue. After preshading the panel lines with flat black, the kit was painted in required base colours using primarily Gunze acrylics – ironically the airframe underneath the paint job is Light and Dark Ghost Grey! 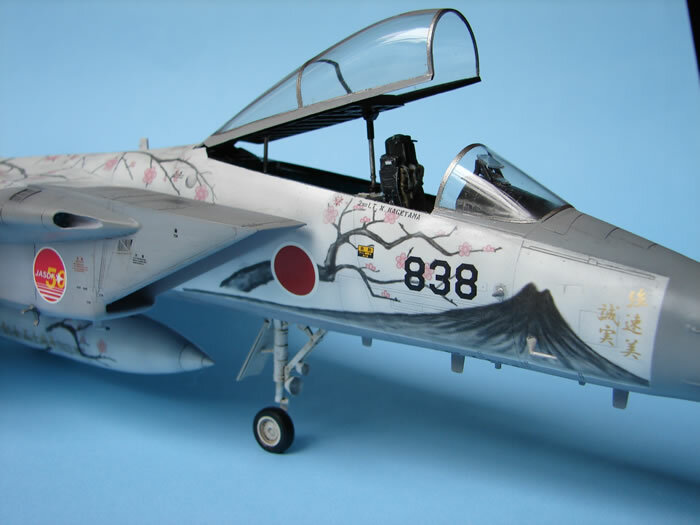 The white area was painted Tamiya gloss white with a few drops of FS3622. The surface was then coated with Gunze gloss for decaling. The main pattern for the wing planform is in two huge decals. To get them to sit down required copious amounts of Mr Softer and in several areas slits in the sheet to get it to conform. It took the better part of 48 hours (on and off) to end up with an acceptable finish, however the process had left the sheet cut in several obvious areas. I diluted several darker paint shades to the consistency of dirty water with Tamiya thinners and using a very fine brush painted in the cut areas. This took several very light applications to give the translucent look displayed on the rest of the frame. Time for sealing. Normally I use Gunze flat with a drop of Tamiya flat base and spray in thin coats. This time I tried the Mr Flat spay can with disastrous results. The lacquer went “hot” and went throught the whit paint, leaving a very obvious decal edge. Uttering a few choice words in the workshop, I resprayed the affected areas with the white mix. Overspray on the decals was cleaned up with a Q-tip moist with Tamiya thinners. Naturally I then flat coated with my normal mixture. Finally the panel lines were detailed with an oil wash of lamp black and burnt umber. The burner cans were treated with pastel dust. Overall weathering was kept to a minimum, as this was an air show frame.